I participated in an Influencer Activation on behalf of Influence Central for Hershey’s KISSES Deluxe. I received product samples to facilitate my review and a promotional item to thank me for my participation. Please see my disclosure policy. Yesterday I shared my secret gifting strategy and some personalized gift ideas for Grandparents who are often so hard to buy for. But another little gifting trick I have is… CHOCOLATE. When all else fails, gift chocolate! Who doesn’t love it, am I right?! Hershey’s KISSES Chocolates are traditionally the number one holiday chocolate, helping American families build sweet traditions of holiday baking, crafting and sharing. But this year Hershey’s has outdone themselves! 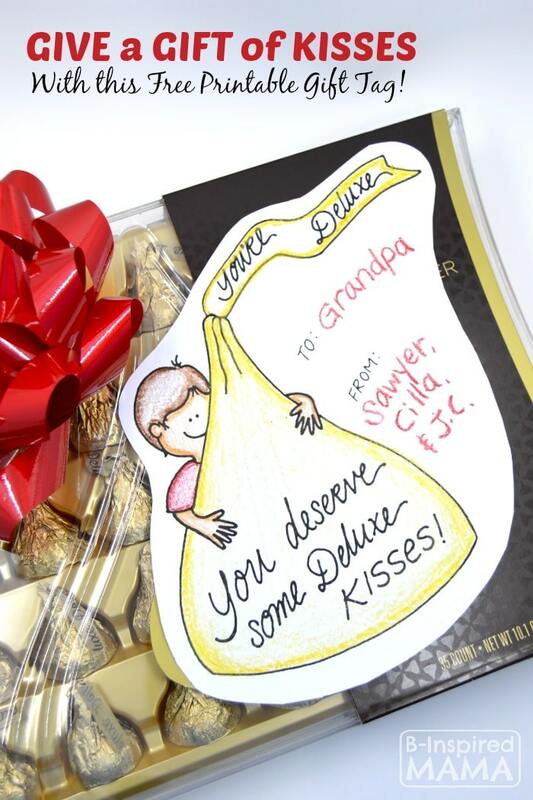 The Easiest & Sweetest Gift: Hershey’s KISSES Deluxe! They’ve unveiled new, bigger, decadent KISSES; Hershey’s KISSES Deluxe! And I’ve created a free printable tag to make them super easy and meaningful to give this holiday season. Hershey’s is proud to be inspiring families to “Say More” this holiday season. All season long, heartfelt stories will be shared through videos and on Hershey’s social media channels, along with information and inspiration to #SayMore to the ones you love. – which are TWICE the size of traditional KISSES, filled with creamy chocolate and whole roasted hazelnuts, wrapped in beautiful golden wrappers and arranged in a fancy gift box – is an easy way to show your loved ones they’re special. 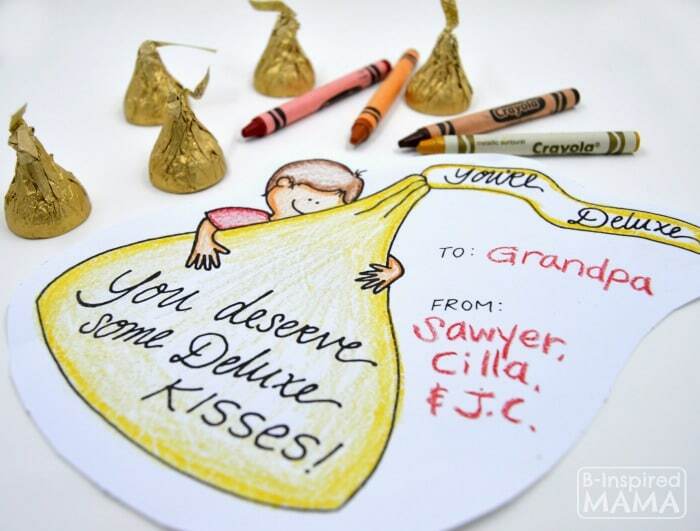 And I made a printable gift tag the kids can color to make gifting Hershey’s KISSES Deluxe even more special and fun. Just download and print the gift tag printable. Choose which gift tag size and which gender child you’d like. 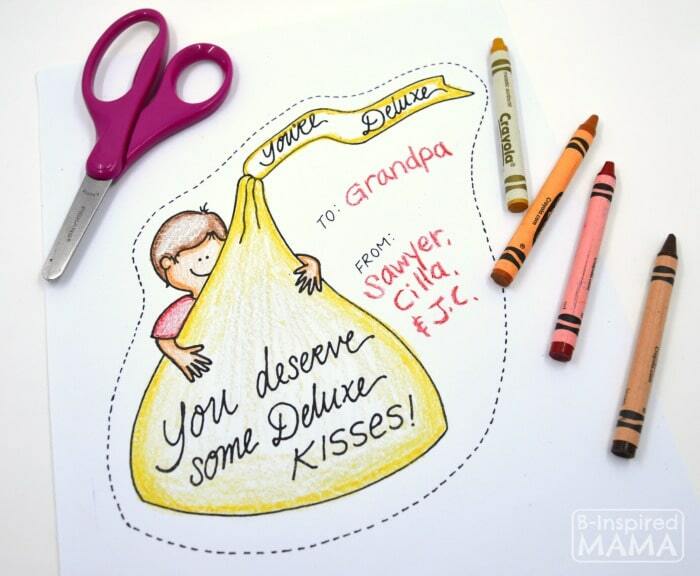 Cut it out, add some color, and attach to a box of Hershey’s KISSES Deluxe! Who on your Christmas list would love this sweet gift? Do you ever gift chocolate for the holidays? Tell us about it in the comments below!